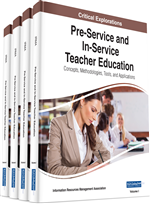 This chapter presents innovation and change in university preparation of teachers requires acquisition of technological pedagogy in response to the demands of a knowledge economy where students are engaged in technology implementation in a constantly changing world. Teacher preparation programs historically have been contained on campus using face-to-face instruction. As the second decade of the twenty-first century unfolds, universities have adopted online learning in teacher preparation to accommodate the needs of a more diverse clientele. Educator preparation now faces two major challenges: a critical mass generated by Net Generation students who have increased demands for online access to learning and a teaching force without prerequisite skills and dispositions to dramatically alter modes of instruction. Technology is having a significant effect on how people live, work together, and communicate, how people lead organizations, but not so much on how adults teach and students learn (Bass, 2012; Bush & Hall, 2011). Historically, teaching involved imparting knowledge and teaching students to think (Bjerede, Atlins & Dede, 2012). Teachers still teach students to think, but instead of just imparting knowledge, teachers are teaching students to understand where and how to find information through the use of technological resources (Hemmi, Bayne, & Land, 2009; Norton & Hathaway, 2008). Adams and Eveland (2007) suggest educator preparation and technology use is not a new concept; however technological advancements have extended opportunities for teacher preparation coursework to move beyond traditional brick and mortar buildings to “click and brick” delivery methods (Kennedy, Tysinger, Bailey & LaFrance, 2013; Terry, 2001). The use of technology means that time and geography, traditional barriers for face-to-face learning, are not issues as students take online teacher preparation classes (Balotsky & Christensen, 2004). Vast and diverse multimedia resources now make it possible to engage learners in interactive and community-based online learning similar to traditional face-to-face settings (Balotsky & Chritensen; Mense, Fulwiler, Richardson & Lane, 2011; Rovai & Barnum, 2003). Given this availability, higher education institutions are creating and offering online courses and program providing education preparation programs to geographically and culturally diverse audiences nationally and internationally (Allen & Seaman, 2011, 2013; Blacher-Wilson, Mense & Richardson, 2011). Teacher preparation programs, historically contained on campus using face-to-face instruction, are changing to meet the demands of a knowledge economy where students expect to have access to technology (Baker & LeTendre, 2005). Online enrollments, in the past several years, have been growing substantially faster than overall higher education enrollments (Parsad & Lewis, 2008; Schofer & Meyer, 2006). Academic leaders expect enrollments to continue their substantial growth in the future (Allen & Seaman, 2007). As the second decade of the twenty-first century unfolds, university leaders are adopting online learning for teacher preparation in order to accommodate the needs of a more diverse clientele (Esprivalo-Harrell & Harris, 2006). It is not necessary for students to ever enter a physical campus (Antonelli, Geuna, & Steinmueller, 2000; Blacher-Wilson, Mense, & Richardson, 2011). E-learning environments provided by technology enhancements provide university faculty the capability to offer educator preparation courses in e-learning environments via the World Wide Web (Alvarez, Guasch, & Espasa, 2009; Rovai & Barnum, 2003). Despite the opportunity, online educator preparation faces two major challenges: (1) a critical mass generated by students who increasingly demand access to online learning and (2) a teaching force without prerequisite skills and dispositions to dramatically alter modes of instruction (Cavanaugh, Barbour, & Clark, 2009).